My husband and I had a date night last Saturday night. My parents took the kids for the night and we headed to Bosco's to sample some beer and eat some good food. We didn't have any real plans other than dinner. After finishing up dinner, we decided to go ahead and get our grocery shopping out of the way. Yes, you heard it right folks. We went to the grocery store on our night with no kids. As we were browsing through the produce section, I saw these amazing potatoes. It was an assorted pack of pink, purple, and fingerling potatoes. They immediately went into the cart. I mean purple potatoes. You have to try them at least once, right? Until I diced them up to roast, I had no idea the intensity of the color permeated the whole potato. In my mind it was just the skin that was various colors. The first thing I did, well after cutting a few pieces of rosemary, was to grab my camera. They just looked too pretty. I did not really know what to do with them so I tossed them in olive oil, chopped up the rosemary, and roasted them in the oven for awhile. I was pleasantly surprised. The purple ones were especially tender. I have about half of them left so next week I am thinking about using them in a frittata. Who knew potatoes could be so exciting? I had no idea there were purple potatoes! I've see those packets at the store and always been interested in them. Thanks for sharing! Beautiful picture of them! Purple potatoes?! I've never seen such a thing - how cool! oh, i had no idea you could buy purple potatoes! I will be on the look out for these! beautiful! I was so curious about the purple vegetable. You mentioned that they are were tender, but are they good, or taste any different? There have been plenty of nights that we got a baby sitter and went to dinner than Sam's Club, Target, Grocery, etc. it is just so much easier without little legs with you. OMG, it's soooo funny that you two went grocery shopping on your date night! Sounds like something I'd ask my hubby to do except we don't get along when we grocery shop together (some things are best done alone) ;) Still, I'd would drag him to Target or something like that. Those potatoes look amazing! I'm going to have to see if I can find them in our store and cook them like you did. Sounds yummy! That is a beautiful assortment of potatoes! Like you said, Who knew? I would totally do the grocery shopping thing! 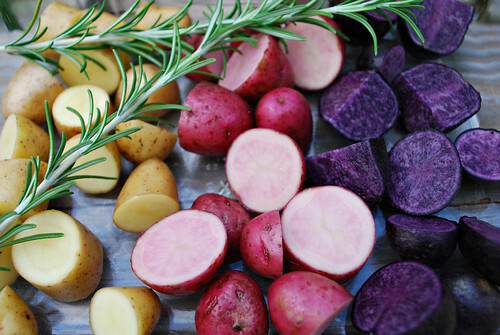 Beautiful shot of the varied colors of potatoes. I saw a show on the Travel Channel that showed all the different kinds of potatoes - it was really interesting. Great shot. Beautiful rich colors. I love it! Purple potatoes? now I've seen everything! this picture is so beautiful, a good one for a kitchen wall, perhaps? I love purle potatoes ever since I discovered them. They can help with skin lightening.